Here are the 6 critions for Hotel RCU. The RCU includes the network wireless lock, the door peephole viewer, the network safe box, the elevator control, unique switch and hotel room detectation. Bonwin RCU is a unique generation of hotel Guest Room Control Unit which uses the international most advanced microcomputer control chip. 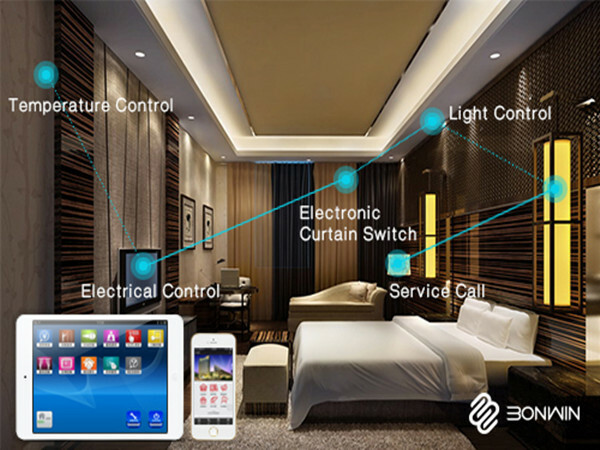 Through the TCP/IP communication protocol, it can control and monitor different target and equipment, such as panel, curtain, doorbell, lamp, fan and air conditioner and so on. The lock allows members to open room directly without check-in. It can be unlocked by wechat, app, guest cards, member cards, touch switches, PC, and etc.. It has a network high definition camera. RCU saves videos for 7~15 days and can upload them to management software when needed. Those videos can also be sent to App and the server, making hotel guest feel safe in the hotel. Smart network code safe box can track the status of switch and alarm for illegal unlock. The elevator can be controlled through Wechat, App, or manual operation floor buttons. The bed head and doorway display contemporary visitors' videos, exit unlock button automatic; replace temperature control switch etc,. Detect air conditioners in hotel rooms (PM2.5, formaldehyde and humidity). Guest room smart switch can control air-conditioner with 5 types of running modes.